The striking gray, black, and white plumage of the gray jay stands out against the winter snow. More commonly seen in northern forests, gray jays are occasionally spotted in north Simcoe. 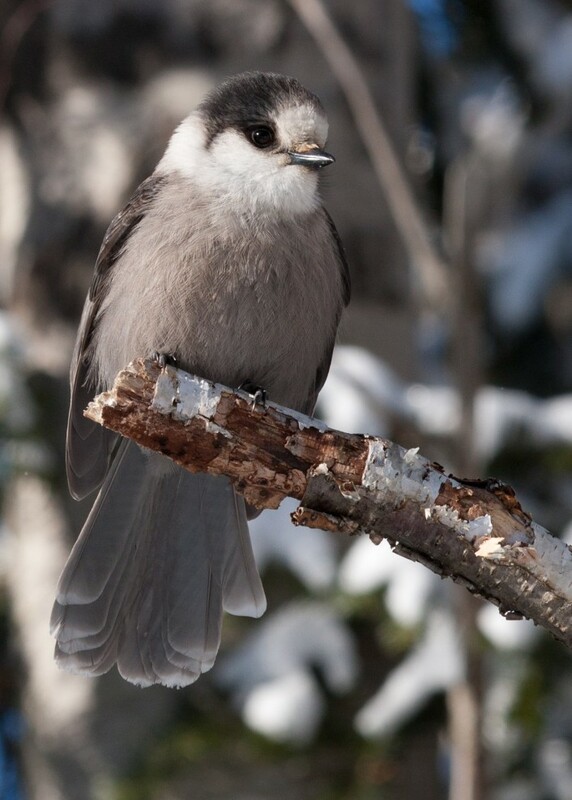 One of the most intriguing birds from my perspective has to be the Gray jay, a.k.a Canada jay, Whiskeyjack or Camp robber! Although you may never have seen one at your bird feeder, a short hour and a half trip north into Algonquin Park will surely provide that opportunity, as the Park tends to be the southern limit for this bird of the boreal forest. From time to time, these birds have been spotted in the Carden area and in the northern reaches of Kawartha Lakes to the east, where stands of black spruce trees in particular can be found. Although it is a member of the same family, the Gray Jay is nowhere near as raucous as the Blue Jay or Crow. They tend to be very friendly and tame, and will sit, with feathers all puffed up quietly in nearby trees soaking in the warmth of the winter afternoon sun, affording one some wonderful photographic opportunities. They will readily accept peanuts and other seeds from an open hand. Algonquin Park campers know this bird as a camp robber, snatching food off a table or even from a pot on an outdoor stove. Gray Jays do not migrate, they carve out a territory and stay there their entire lives. They spend the spring summer and fall gathering food, consisting of spiders, insects, berries, mushrooms, bits of carrion, seeds and nuts and other delights which they store in tree crevices or under bark. This food will be used to sustain them throughout the winter months. By its very nature, much of this stored food is susceptible to deterioration during the warm months of summer and fall, and the effects of freezing and thawing in winter. To mitigate this deterioration, it is thought Gray jays have some antibacterial qualities in their saliva. They prefer to cache their food under the bark of Black Spruce trees, a tree known for its resin, which may in turn may kill bacteria and protect the stored food from spoiling. Gray Jays tend to pair for life and interestingly; they nest early in the new year, incubating their eggs in late February or early March. The eggs hatch in March and the young fledge in early April. Most of our songbirds are just beginning to head north from their wintering grounds when the young jays take their first flight. In June, the young birds will engage in a critical struggle for dominance and the weaker siblings will be chased from the territory by the victorious young bird. This dominant one will stay with its parents for two or three years, before it ventures off to find its own territory and mate. The weak siblings will most often die, but a small percentage will hook up with another adult pair who has experienced nesting failure. Much of what we know of these interesting avians emanates from the research carried out by Dan Strickland, the former Chief Naturalist of Algonquin Park. Dan has spent many years engaged in research on the species which he continues to do in his retirement. If you drive along Highway 60 from Huntsville to Whitney and find yourself following a car with “Gray Jay” on its licence, you can be sure Dan is heavy into his research or mentoring some young biologist. The most likely spots to find Gray Jays during the winter in Algonquin are at Spruce Bog Parking lot and the attendant board walk; at the far end of Opeongo Rd. near the gate or at the Park’s Visitor’s Centre. Take along a bag of raw peanuts and enjoy your time with a really fascinating bird! This entry was posted on January 7, 2013 at 10:12 am, filed under Birds and tagged bird feeders, birds, boreal, forests, nature, photography. Bookmark the permalink.